Losses In D.C. — A Generators generator transforms mechanical energy into electrical energy. The energy output of a generator should be theoretically equal to the energy input. But, some energy is always lost in the windings, cores, etc. and the output energy is always lesser than the input energy. The copper losses of electrical losses are caused due to the resistance of brushes, Armature and field windings. Armature Loss– The Loss Due to the resistance of the armature coil is equal to I2a . Ra where Ia , is the armature current and Ra is the armature resistance. This loss can reach up to 30 to 50 percent of total electrical energy generated at full load. Iron losses or magnetic losses or core losses are used due to the dissipation of electrical energy by the cores of the field poles, interpoles, and armature drum. › Eddy current loss- The dissipation of energy due to eddy current can reach up to 20 to 30 percent of the applied mechanical energy. › Friction loss at bearing and commutator. 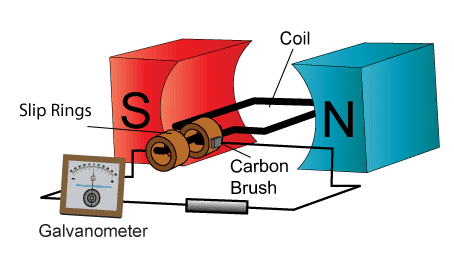 › Air friction loss of rotating armature. › Friction loss at brushes. The total mechanical losses may reach up to 10 to 20% of the applied mechanical energy. (A) Stray loss- The sum of magnetic and mechanical losses is called stray loss. Constant loss=Iron loss+mechanical loss+Shunt field loss. (D) Total loss= Constant losses+Variable losses.